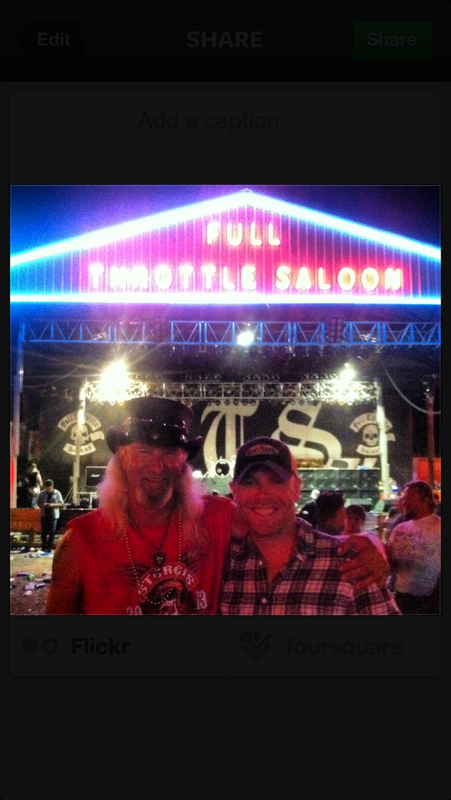 Today is Tuesday August 6, 2013: We are spending two days in Sturgis and have a little work to do. First things first – Jimmy and I have to get to the Victory store and check on parts for Josh’s bike (See August 5 here for details). That was a 35 mile ride from Sturgis to Rapid City but would give us a chance to motivate earlier than the rest of our crew. I was going for moral support as Jimmy would have to do the work. Unfortunately the store didn’t have the part and even if they did, they wouldn’t have time to work on the bike this week. Jimmy ordered the part to be overnighted and the store expected to have it by 10:00 AM the next day. Jimmy would have to do the work in the parking lot of the store but he was confident that the regulator and battery both needed to be replaced. Luckily the house where we were staying was owned by a friend of Ray’s. She had an 800cc metric cruiser and offered it to Josh for the day. She is a rockstar and went above and beyond for a landlord! We would take an easy stroll to downtown Sturgis and take part in the festivities that are bike week. I was on the lookout for a new fender and maybe wheels if I found a deal. The rest of the guys were looking for shirts, pins and stickers – the normal stuff for a rally. 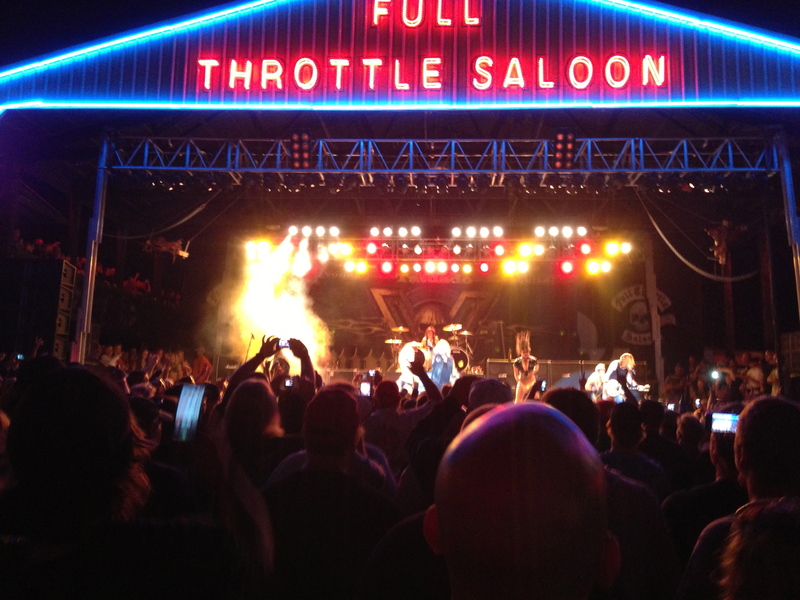 It was a much needed day of rest for us to prepare for the Full Throttle Saloon that night for the Motley Crue show ( Article) video of Motley Crue at the Throttle The next day (Wednesday August 7, 2013) Jimmy would fix Josh’s bike and I would get some new wheels and fender put on. Josh’s bike runs and I would be on the lookout for new bolts for my fender as the Fat Bagger Industry adapter required 2 ¾ and 5/16 bolts that were hard to find at the shop. After going to J&P cycles across the street and only finding two of the necessary bolts, I would meet the guys at the Rapid City Harley Davidson shop and look for the remaining two bolts. Luckily the parts department had a handful of bolts and though they were 4” we could cut them and make them work. Mount Rushmore was 25 miles from Rapid City so we would set out with the clothes on our backs for this monument and for Crazy Horse. Needless to say, the sky went dark and a downpour ensued. I didn’t bring my raingear because I hadn’t planned on doing an actual ride. Poor planning – rookie move. We had to stop because the rain made the streets slick and we were in a bit of a technical area. Luckily there was a restaurant called Ponderosa up ahead so we pulled in to take cover and get a quick dinner. 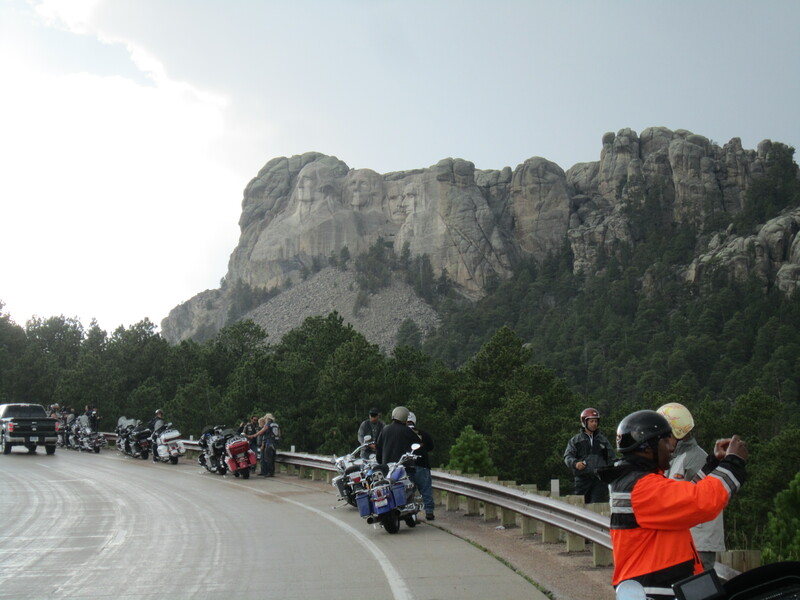 When it looked as though the rain was done, we would ride to Crazy horse. Cold and Wet: My jeans and shirt never dried and now the sun was dropping. It was 65 degrees and getting colder. 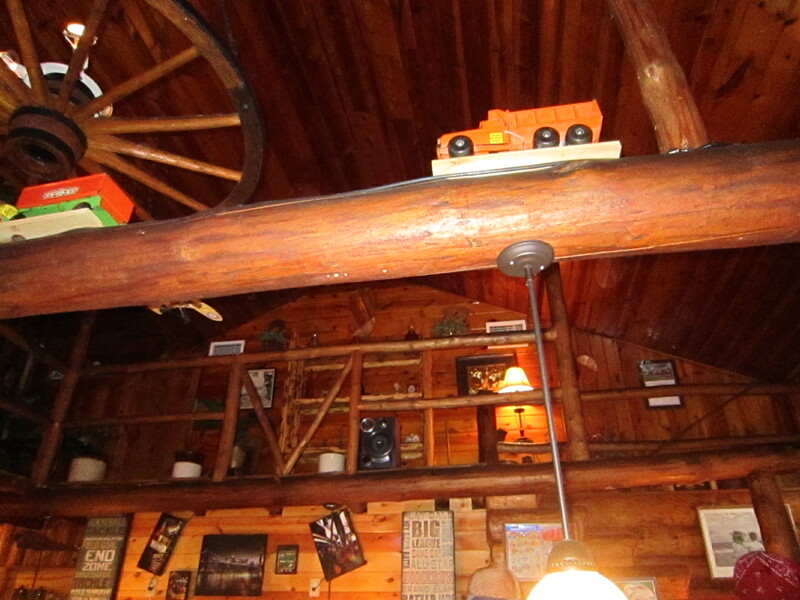 We did take some pictures of Crazy Horse and then picked up some memorabilia. If you are ever at Crazy Horse, make sure to buy the $1 Caramels by the register. Overpriced but amazing for quick riding sugar. Clouds rolled in and we heard reports of Hail. I hate riding in the hail as I’ve done it twice while properly equipped and neither were pleasant experiences. We also learned that two riders went off a cliff on the Needles highway that afternoon as they were hit with similar storms. Needles is a very technical ride that challenges most riders in perfect conditions. A passenger coupled with ice and rain seems like a dangerous proposition and I wouldn’t want to subject myself to that type of ride. We would skip Needles (though the map below shows our perfect ride) and head North toward Deadwood. The ran came and the roads were soaked. Making matters worse, I was on brand new tires that still had the slippery substance that makes dry riding hard. Right now it was as if I was on a sheet of ice. Slow would be our speed. We pushed on through Deadwood and arrived soaked, cold and filthy at the house. We would crack open a few beers and it came to us. White Knuckle Baggers. Anybody who rides late into the night – deals with thunderstorms, hail, wild animals and generally awful riding conditions just to go out and get their riding high – is a White Knuckle Bagger and proud of it!